NOTES: Made from 10 and 20 thou plastic card. Plus toothpicks and cocktail sticks. I suggest a reconnaissance sortie to your nearest cocktail bar. What you are looking at here, dear reader, is the very first aircraft. If that strikes you as a little strange, then read on. The Daimler Petroleum Reitwagen (riding car) or Einspur (single track) was made in 1885 by Gottlieb Daimler and Wilhelm Maybach. 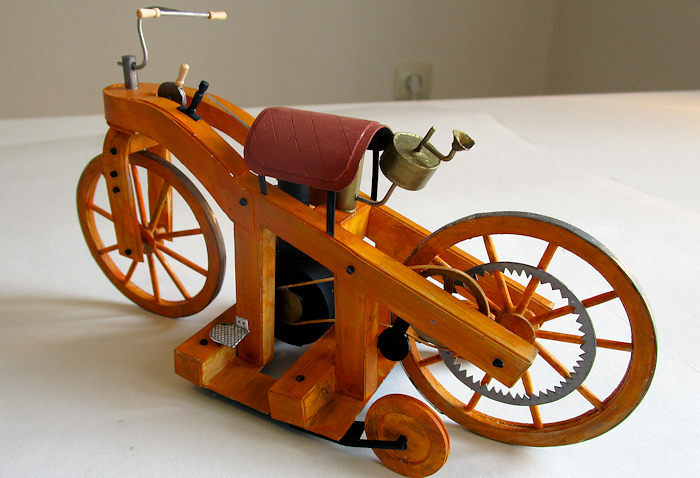 It is widely recognized as the first motorcycle, even though it had two sprung wheel outriggers. 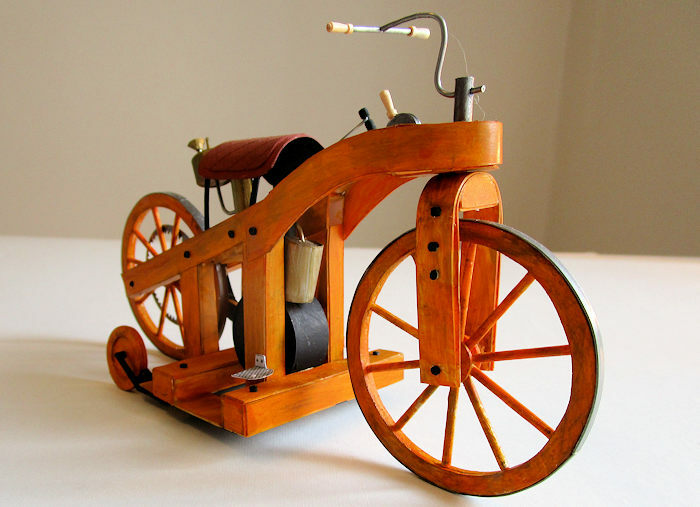 True, there were a couple of steam powered two-wheelers which preceded it, the Michaux-Perraux of 1867, and the Roper of 1884, but nonetheless the Reitwagen remains the first petrol internal combustion motorcycle. So it can be said to be the very first of all the huge number of vehicles, whether on land, sea or air, that use this ubiquitous engine. All internal combustion engined aircraft owe their existence to this not very good motorcycle. The Daimler testbed did not use the principles of rake or trail on its wheels, even though these were already in use on bicycles. Purists continue to argue whether it is therefore a true motorcycle. The only addition to this debate which I will make is: take one look at it. 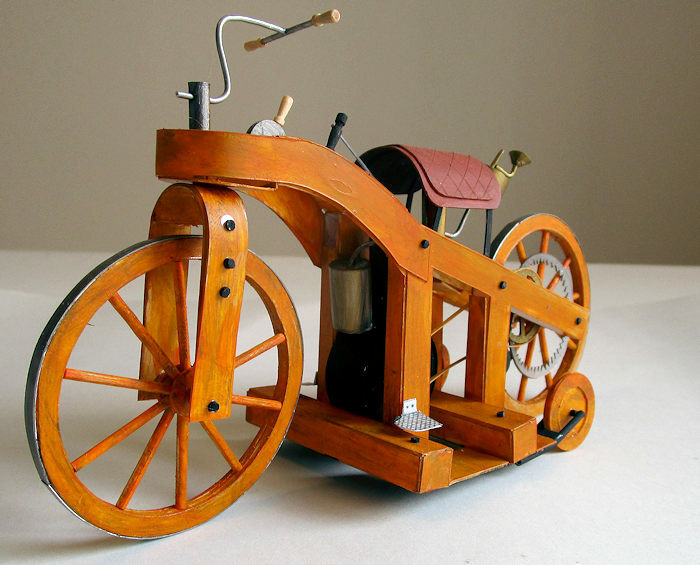 There is however one other contender for the title of first petrol engined motorcycle and that is the Italian Enrico Bernadi's 1882 one cylinder Motrice Pia, a three wheeler which was intended for children. However little is known about it, and no mainstream automotive sources argue its merits. 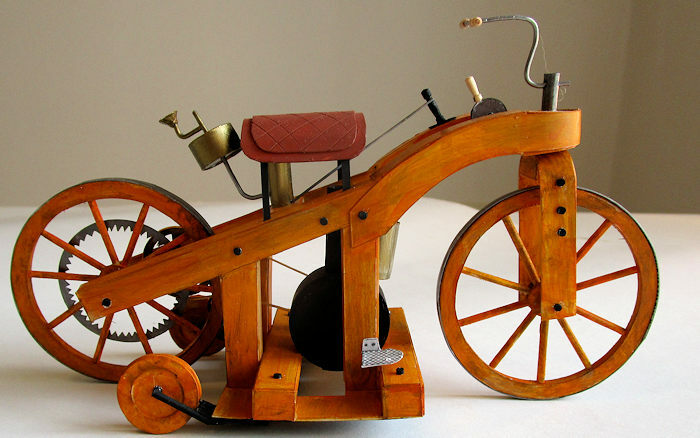 Gottleib Daimler visited Paris in 1861 and saw the first internal combustion engine developed by Etienne Lenoir. In 1872 Daimler became the director of N.A. Otto & Cie the world's largest engine manufacturer. Otto's company had created the first successful gaseous fuel engine in 1864 and in 1876 finally succeeded in creating a compressed charge petroleum engine thanks to the directions of Daimler and his engineer friend Maybach. Daimler then left and took Maybach with him. Together they moved to Cannstatt where they began work on a "high speed explosion engine”. This goal was achieved in 1883 with the development of their first engine, a horizontal cylinder engine that ran on naphtha. The Otto engines were incapable of more than 200 rpm and had no throttle. Daimler's goal was to build an engine small enough to be used to power a wide range of transportation with a minimum rev speed of 600 rpm. This was realised with the 1883 engine. The next year Daimler and Maybach developed a vertical cylinder model, known as the Grandfather Clock for obvious reasons, and achieved 900 rpm. It had a float carburettor, intake valves which which were opened by the suction of the piston, and hot tube ignition, which was a platinum tube running into the combustion chamber, heated by an external open flame. There were twin flywheels and an aluminium crankcase. They attached the engine into a two wheeled test frame which was patented as the "Petroleum Reitwagen" (Petroleum Riding Car): and so Daimler became the father of the automobile. The original design of 1884 used a belt drive and twist grip on the handlebars which applied the brake when turned one way, and tensioned the drive belt when turned the other. The 264cc engine was mounted on rubber blocks, and the frame used two iron tread wooden wheels and a pair of sprung outrigger wheels to help it remain upright. Its engine output of ½ a horsepower at 600rpm gave it a top speed of just under 7mph, only a little faster than a fast walk. Daimler's 17-year-old son, Paul, rode it first on 18 November 1885, on a 5 mile trip from Cannstatt to Untertürkheim. Alas, thanks to the open flame which heated the hot wire ignition, the seat caught fire. And so presumably any observers of this historic excursion were treated to the sight of a rider with flames engulfing his lederhosen. It is surprising that the whole foolish enterprise of the internal combustion engine ever managed to catch on. By 1886 the Reitwagen was abandoned in favour of further development on four wheeled vehicles. The original Reitwagen was destroyed in a fire in 1903, but several replicas exist in collections at museums in Stuttgart, Munich, Ohio, Australia and Japan. The replicas vary considerably, depending on how they interpret the original plans and which model they follow. So anyone wanting to model this historic machine will have to make up his own mind about which version to follow. There are even short films on Youtube of enthusiasts riding the replicas. Presumably their trousers are made of asbestos. I couldn't find any scale plans online of this machine and so had to rely on technical drawings of the original combined with photographs of the various later replicas. What determined the scale was the fact that I knew I would have to use cocktail sticks to replicate the wheel spokes. Once their thickness was measured, I realised that they came close to about 1/6th scale, and so plans and rough sketches were drawn up accordingly. I always start a scratch build with what will be the trickiest part of the build, so that if that fails, then the project can be abandoned without too much heartache. In this case I knew the wheels would prove to the deal-breaker. In fact they proved quite easy, thanks to a circle cutter, which has since proved an invaluable piece of kit. I bought mine in an artist's store, and if you don't have one, I would heartily recommend that you buy one. They look like a pair of geometric compasses, but with a replaceable blade instead of one of the points. I cut several thickness of card to the right diameter, sandwiched them together with glue, and then ran a band of ten thou card, painted gunmetal, around the edges to form the steel tires. The hubs were made from wooden kebab skewers with circular card outsides. Then the cocktail sticks were all cut to length and glued in place. The main frame and rear forks are made up of quite crude card boxes, the only tricky part being the curved front section. The engine is a simple tube mounted on a circular crank case. The strange drum to the rear of the seat is a small petrol tank, complete with little funnel for filling purposes. The inlet pipe is thin solder. The handlebars are also thin solder, which is an invaluable alternative to hard wire as it is very pliable, and maintains its shape nicely. I didn't even have to paint it. The two handlebar grips both came from fancy cocktail sticks which had the grips moulded onto the ends. The throttle lever and the drive belt control also came from the same source. The saddle was made from two thicknesses of card, scored for the seat pattern and mounted on black card supports. I did not try to replicate the naked flame under the seat which heated up the platinum ignition tube. Sometimes you can take realism too far, and I didn't want to burn down my study. 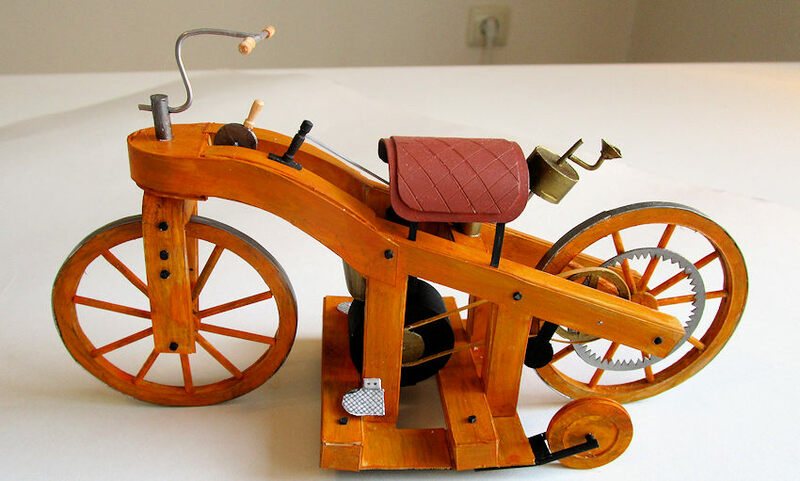 The belt drive is thin card, coloured pale leather, and wound around various wheels, cogs, and gears. And the ring gear on the rear wheel was formed again with the circle cutter, with the teeth cut out individually, a task which was about as fascinating as watching the floor boards warp with age. Incidentally, have you ever noticed that in so many builds there is one task which is very necessary for the ultimate look of the model but which proves tedious in the extreme? Rather than sand another Amodel aircraft into shape ever again, I would sooner have my ears removed with a cheese grater. The circle cutter came into its own again for the easy fabrication of the training wheel outriggers. The whole thing was given a coat of Sand or Mid Stone (I am not sure which one, as the Lifecolour label has come off the pot). Dark earth was then dry-brushed on with a fan brush to represent the grain. It all got a coat of clear orange. A couple of footplates were made from card, cross hatched, and painted gunmetal. A few bolts were made from end-cuts of plastic rod, painted black and scattered judiciously around the place. There you have it, the world's first aircraft, the first motorcycle, the first car, and the first motor boat. 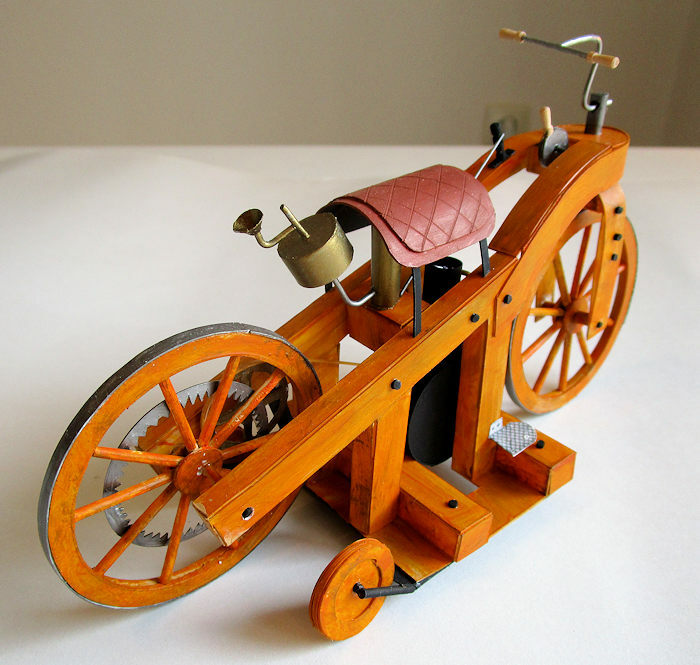 Indeed, any form of transport which used the internal combustion engine owes its existence to this little machine. In a way, it is a tribute to all mass transport of the 20th century. With the 21st century shaping up to be the era of the electrically powered driverless car, perhaps I should be trying to find the first ever slot car to model.